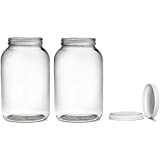 Amazon's Choice for "mason jar funnel wide mouth"
Perfect size for my pre workout and creatine. Exactly what I was looking for! 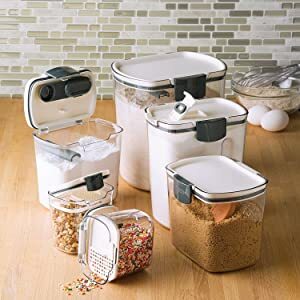 — Carmen S.
We create kitchen storage solutions and cooking tools to contribute to a healthier lifestyle while ensuring those solutions are budget friendly. Enjoy cooking from scratch with products that encourage using fresh ingredients, trying new recipes and entertaining friends and family. Progressive International boasts over 40 years of thoughtfully innovating kitchen products essential to the everyday cook. 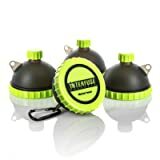 What began as a small family of housewares products has grown into a collection of unique gadgets and tools dedicated to food preparation and storage. As the kitchen is the heart of the home, our customers remain at the heart of what we do as an organization. At Progressive, our team is continually developing products intended to exceed the quality expectations of our customers. 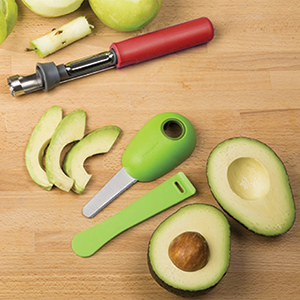 Our Prep Solutions collection features innovative gadgets that will fit any lifestyle and budget at a great value. 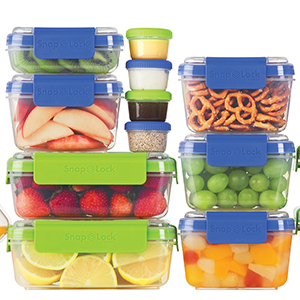 Our line of easy-to-open, leak-proof containers with unique hinged snap-off lids for all your family’s food storage needs. 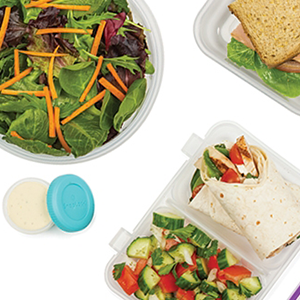 Our Prepworks products are about convenience and control of everyday meal preparation for the busy home cook. 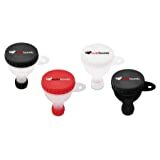 The Prepworks by Progressive Canning Funnel fits wide and regular mouth canning jars and is designed with a double wall. 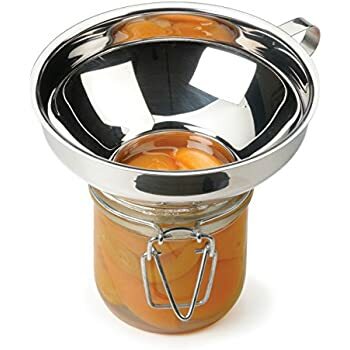 The outside part of the funnel sits on the counter and the inside is shorter and sits over jar, helping to keep the canning area cleaner. It features headspace measurements for precise filling, and necessary air space for proper sealing of canned goods. 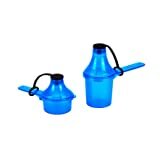 The funnel measures 5.13-inch diameter by 3-1/4-inch high and is made with high heat polypropylene, preventing stains. It is dishwasher safe. I try to live a frugal and simple lifestyle, and my kitchen reflects that. I prefer to have the equipment I need, balancing price and function, and generally ignoring aesthetics. 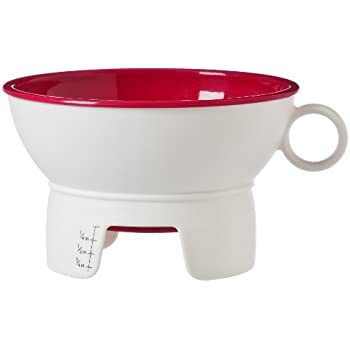 Small things like measuring spoons, basic utensils, etc. definitely aren't fancy in my kitchen. Every once in a while though, you find a kitchen gadget that costs a few dollars more, but is worth every penny. 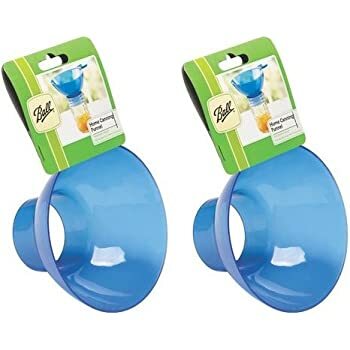 This funnel is that kind of product, and I wish I would have purchased it sooner. 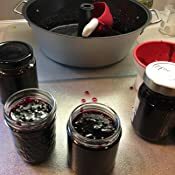 I use it regularly, usually to pack quart canning jars with varieties of different soup for freezing. 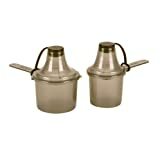 It's perfect for transferring everything from hearty chowders to stock into any size glass jar, regular or wide mouth. I was concerned about warping or melting from heat, since I usually funnel hot soups, but I've had no issues with it. 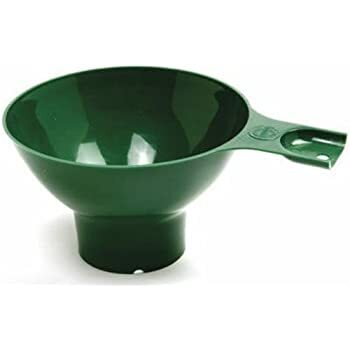 The top of the funnel is large enough to accommodate my largest ladle, so there's less dripping. It's much less messy. My counter top stays clean, and the smart design prevents food contamination since the inner rim doesn't contact the countertop. The headspace gauge is accurate, and helps prevent overfilling, so no more mishaps from freezer expansion. Best of all, it's easy to clean, and doesn't have a bunch of hard-to-reach nooks and crannies to scrub. I've washed it many times in the dishwasher, top rack, with no problems. 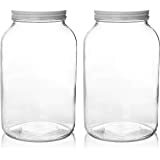 This is a must have item for anyone who cans, freezes or uses glass jars for any kind of food storage. 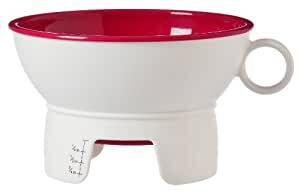 I really wanted to like this funnel as I love the matching ladle but I just couldn't! It is just too slow and messy. Has a couple of really cool features that I like to include the head space gauge and the fact that the funnel completely encapsulates the rim of the jar, great ideas! But they made it too narrow IMHO. Compared to using my old standby Norpro funnel I have to be much more careful and pour slower from the ladle to preclude making a mess. 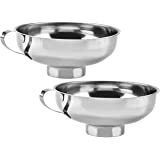 The Norpro which is much wider at the top lets me pour just about as fast as I can ladle. 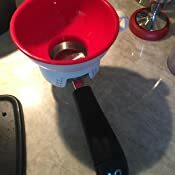 5.0 out of 5 starsNot Your Typical Canning Funnel....Clean and Clever! 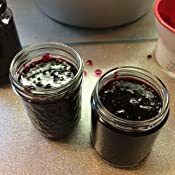 As a regular home canner and Master Food Preserver, I was anxious to give this product a try. The clever design prompted me to try this funnel out and make it one of my regular pieces of canning equipment. The material is heavy weight (double walled) and stain free. I bought the wide-mouthed version and it fits very well. When placed on the jar it fits nicely and is more secure than the traditional funnel. The outside wall also fits over the seal surface so cleanup before putting on the lids is a snap. Having the built-in headspace measurements enables precise filling; allows necessary air space for proper sealing. 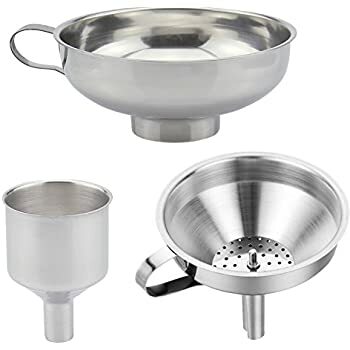 One thing you may not notice right away is that the outer collar keeps the funnel off the counter so when you set it down, the counter does not get messy. 3.0 out of 5 starsbuy these separately? I had mixed results with this set. First, I LOVE, LOVE, LOVE the funnel. It fits nicely on all canning jars. You'll need to retrain your eye as far as filling to the right level. The great thing about it, though, is that the there are two rings at the bottom. An outer ring supports the funnel as it rests on the counter. 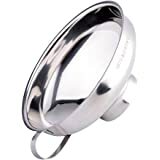 The inner ring that comes in contact with the food to be canned is raised off the counter when you set it down after use. 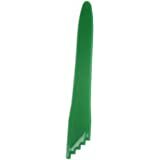 No more slopping up your work area with jelly, syrup or sauce, etc! Great design! The magnetic wand lid lifter is OK, but i think I prefer my simple wooden dowel with a magnet bolted to the end. 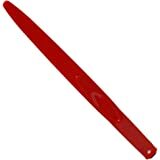 I had serious problems with the jar lifter. 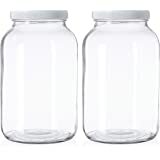 The grip gave way at times, especially on heavy quart jars. 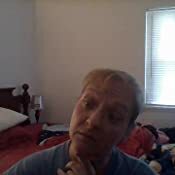 Perhaps the steel is too thin? I completely closed the grip so the two sides were touching, but the jars still slipped. Not cool. 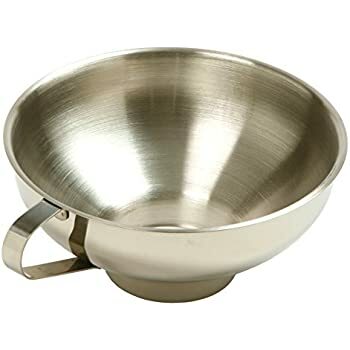 1.0 out of 5 starsIt's the most awkward ladle I ever used !!!. Great concept , bad design !! 5.0 out of 5 starsGreat canning funnel! This was a nice improvement over my other canning funnel. The design makes it so you don't have to hold on to it while filling your jars. Also love the measurements...takes out the guessing when leaving space on top. I bought this set because I REALLY wanted the funnel and I had melted our magnetic lid grabber awhile ago so why not upgrade a little. Finally tried out the funnel and bottle grabber today. The funnel is fantastic! very stable; measures well; and I'm really not sure how I've lived without it for so long. 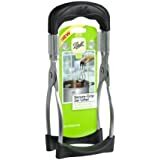 As for the bottle grabber, when I saw it I thought "what a clunky piece junk that exceeds my hand span," but I tried it out so I could give a "reasonable" review and WOW! it works marvelously... I have been using a rubber coated metal one for years and I always drop the bottles and have trouble getting the right grip. I didn't realize that it could be so easy! The concave shape readily wraps around the bottles and it works wonderfully with pints and the especially-challenging-for-me 1/2 pint bottles that I love to use. 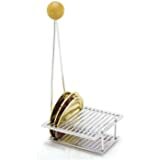 I have been looking and looking for a rack alternative to the big handled ones at the hardware. 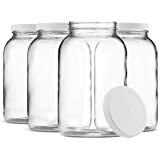 This one supports the smaller jars well, and I would recommend it to anyone who does smaller jar canning. I am thrilled that I could find it on Amazon.